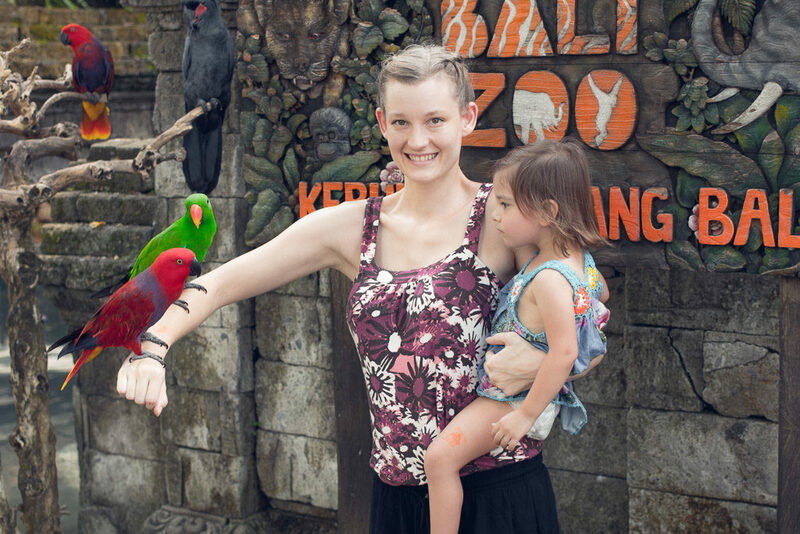 Let me start out by saying, we had SO MUCH FUN at the Bali zoo! In fact, it is my top pick of the many things to do in Bali. Built from the funding of a sole founder (can you imagine?) who had dreams of creating the first ever zoo in Bali it really is a unique experience. For starters, it’s more than a zoo. There’s an onsite waterpark. A PERFECT spot to spend those hot Bali afternoon hours. All that walking around have you feeling a bit sore? Head to the on-site spa for a massage! You can stay there. They have villas (with pools of course) located on-site. Then, of course, there are the animals. What sets this zoo apart most of all is the opportunities to get up close and personal with the zoo’s inhabitants. Bird perched on a branch in the Bali Zoo Park. You can expect to see over 500 animals – including many rare and exotic. As part of their conservation efforts, the zoo routinely breeds and releases endangered species including Bengal tigers, bearcats, Bali myna and silvery gibbons. It’s even been named the best conservation Institution in Indonesia! Some animals even roam the zoo freely so be sure to look up into the trees to spot a few hanging around. Don’t miss the white tigers! 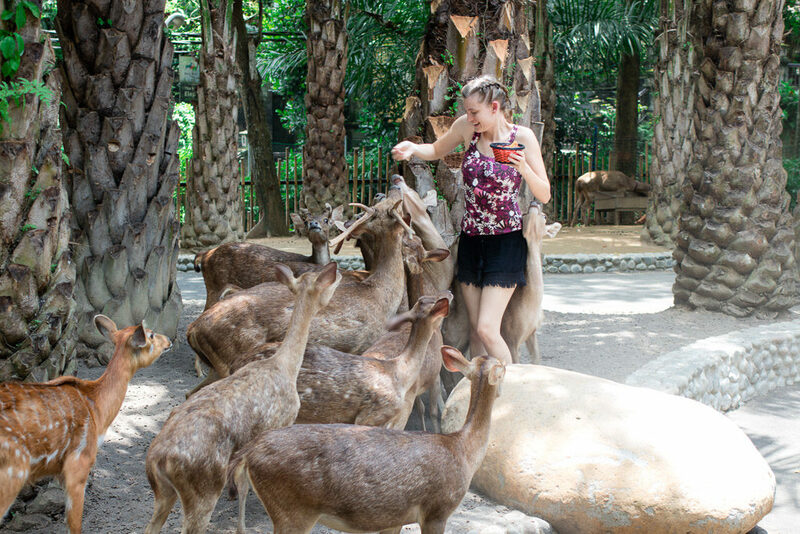 The first thing you see upon entering the zoo are deer wandering freely – including a LOT of babies. They are very clearly used to humans and comfortable with their presence. For a nominal fee, you can feed them a basket of vegetables. For kids, I suggest stopping to feed them on the way out. I did it in the morning and they were a bit rowdy. On our way out there were 3 people feeding them and the deer seemed less impressed. The deer have shaded feeding areas as well, so they’re dependant on the kindness of tourists. 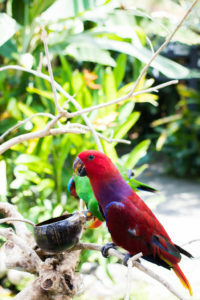 In addition to the bird show (check timings at the beginning of your visit so you don’t miss it like we did), you can hang out with them for a short time and get an awesome photo. 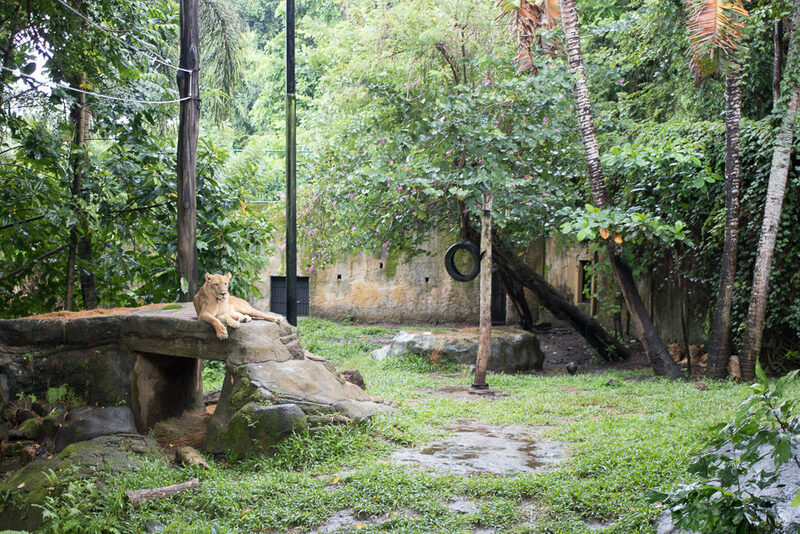 Using a long, metal stick guests can feed lions chicken meat through a metal gate. This one you’ll want to do early because they are only allowed a certain amount of tourist-fed food to maintain their healthy diets. There are several elephant encounter options. 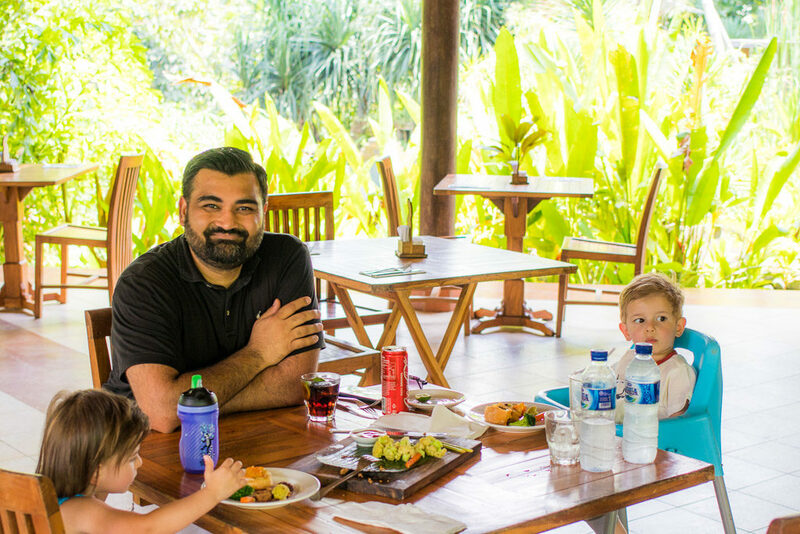 You can do “dinner and a show”, an “expedition” aka the Bali zoo elephant ride where you ride the elephant (in a carriage – boo), “Mahout For a Day” – where to care for an elephant, bathing, feeding, etc. with their caretakers for the day or you can just swing by to say hi or feed them a snack. I do not support riding elephants with carriages under any circumstances. I also don’t love when they’re used like circus animals to dance and parade in front of humans. Please skip both the short “safari” and night show – maybe if the demand gets low enough they’ll drop those offerings. (a girl can dream right?) 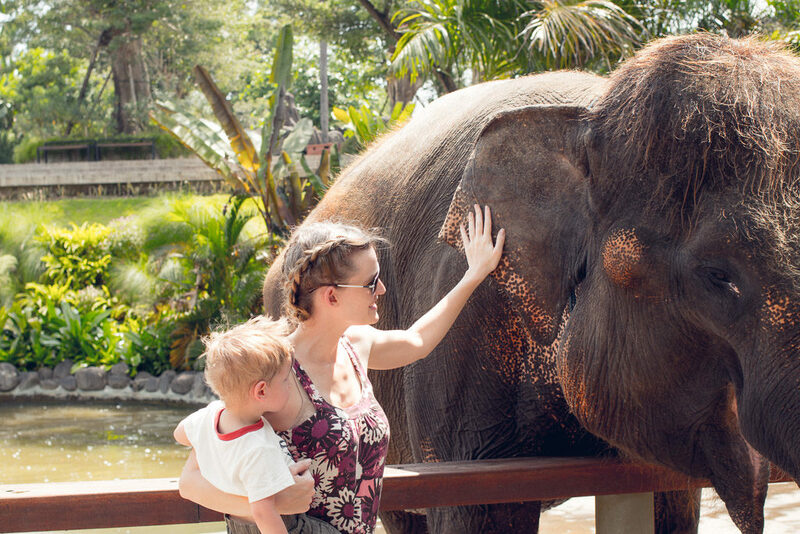 Opt instead to visit with the elephant, bathe them, feed them healthy snacks or watch them enjoy an afternoon coconut treat from their handlers. One of the things that excited me about the zoo was the breakfast with orangutans option. To be clear, your not seated at a table with the orangutans. There are a bunch of visitors enjoying a breakfast buffet, while two orangutans hang out off to the side, doing their own thing. At a designated time, guests are invited to go stand near them to pose for a photo. You are obviously not allowed to touch them but they may choose to touch you, so be prepared. Young kids can enjoy a pony ride in the zoo – be sure to ask about timings. The zoo is open from 9-5. I (as usual) recommend going early. You can explore half the zoo, eat lunch then spend some time in the waterpark to escape the midday heat before exploring the rest of the zoo. There is parking on-site but it fills early in the day. I like my kiddos buckled in their car seats so we used the hotel car. 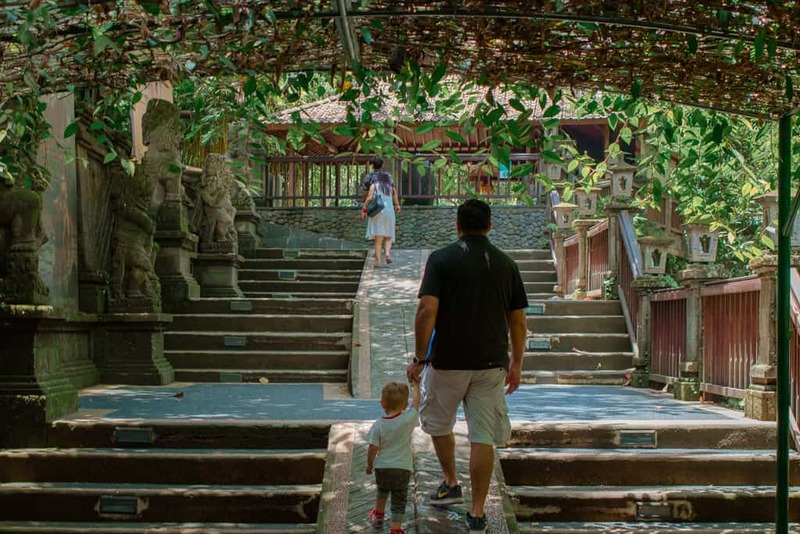 The Bali Zoo has packages that include hotel pickup. Taxis or scooter rentals are also options. Plan to spend at LEAST 3 hours at the zoo if you want to see all the animals – more if you want to add in animal encounters or a show. We spent 5 hours, did a few encounters, the waterpark and were able to see most, but not all there was to see. The waterpark has showers and changing rooms. 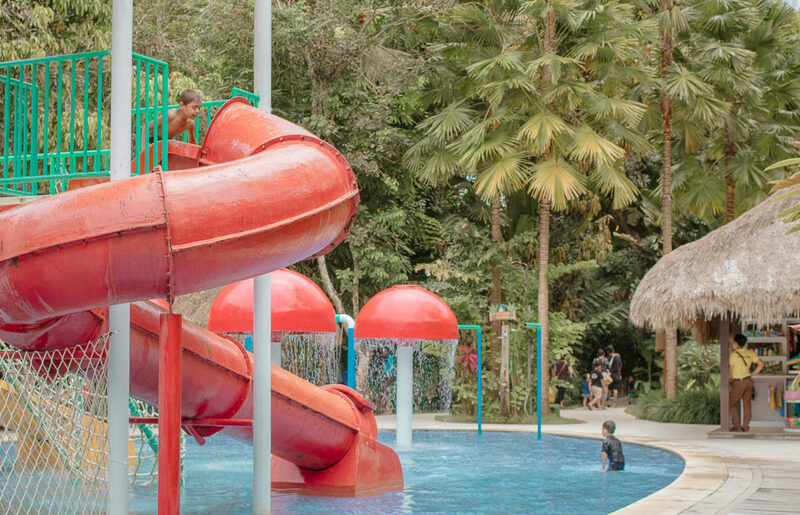 You can rent a cabana or purchase swim diapers, swimsuits and water toys inside the waterpark. The Zoo is small, which is nice for tiny humans who insist on walking… slooowly. 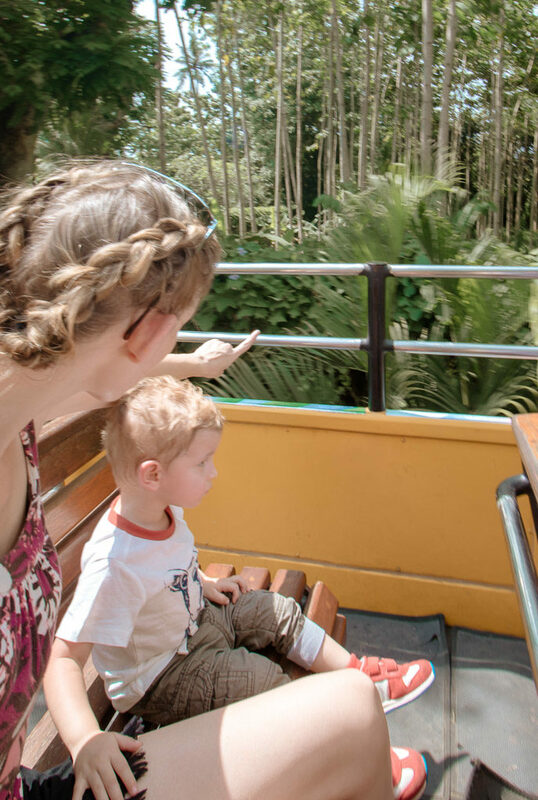 To make it even more convenient, a safari style shuttle will take you to the opposite side of the park for free. Book your Bali zoo tickets online before you go (no need to print anything). Tickets start at $25 for adults, $15 for kids 2-12. Kids under 2 are free. The tiered, package based pricing is a bit confusing. If you’re not doing the breakfast, the dinner show, mahout for a day, or the elephant expedition the general zoo admission is the way to go as the remaining animal encounters are free – you just need to buy the food inside (carry cash). Yes, but if you wish to use the shuttle there is no avoiding an entire flight of stairs. Stroller users can carry it up but wheelchair users might need to skip it. 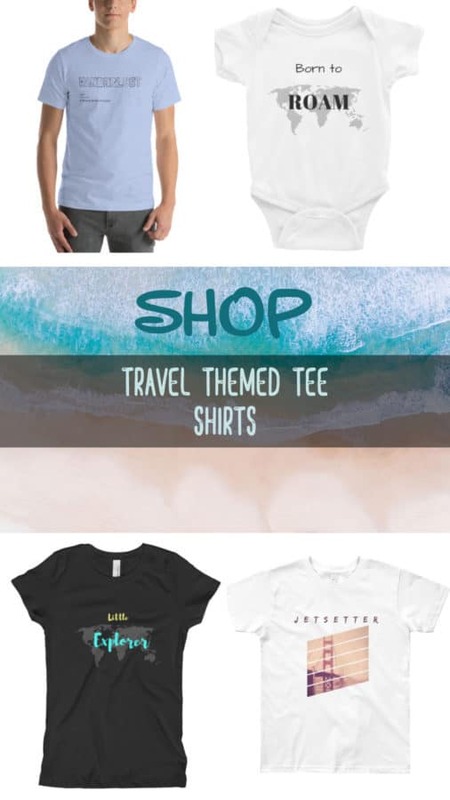 Click here to read about more fun things to do in Bali!